I read an interesting article yesterday, on one of my favorite running and nutrition websites Competitor Running. The article was called "Do The Math: Percentages In Diets Are ‘Meaningless’". It says that the various recommended ratio of carbs, protein and fat for endurance athletes given in percent are inaccurate. I mentioned in one of my previous posts that endurance athletes are suggested to take in a 60/20/20 ratio. Other sources step away from the high carb intake and rather suggest a 40/30/30 ratio. Nutrition is a very complex subject, and its science still very young and far from being conclusive. And I am no expert either. However, the findings of a Dutch scientist specializing in endurance performance and nutrition make so much more sense to me. He is a triathlete himself, I thought this is worth mentioning. Asker Jeukendrup says that it is not so much the percentage, but the total quantity of carbs in grams or calories that counts. For endurance athletes, carbohydrate needs will vary from 5-10 grams per kilogram of body weight per day with training ranging from one hour per day to five hours or more. My weekly training load does not exceed one hour per day on average. Which means I'll be good with 5g carbs per kg body weight. Not surprisingly, on days when I exercise I crave more carbs than on rest days. Looking at the statistics of my food journal, I do meet my total carb requirements according Jeukendrop on most days, although the percentage of carbs on that day is still way below the recommended 50 or even 60%, rather in the high 30s% or low 40s% region. I was trying to up my carb intake, but really struggled to get it beyond the 50% mark with normal sized food portions. I even re-introduced some grains into my diet to see if it would make a difference. Because carbohydrates are used for fuel only and don't serve structural purposes like fat and protein do, you need proportionally less carbs, the less active you are. This is probably the reason why the paleo diet is popular with so many people these days. With a rather sedentary lifestyle in the office and at home, physical activity is reduced to a minimum unless you make an effort to exercise regularly. The protein requirements are slightly increased for athletes as they serve to rebuild damaged muscle tissue after a workout. The recommendations lie are around 1.5g of protein for each kg body weight for endurance athletes. They would be higher if you did bodybuilding. Now that carbs and protein needs can be calculated rather exactly and with a bit of testing you will know how to meet your personal requirements, the rest should be filled up with healthy fats. It's as easy as that. 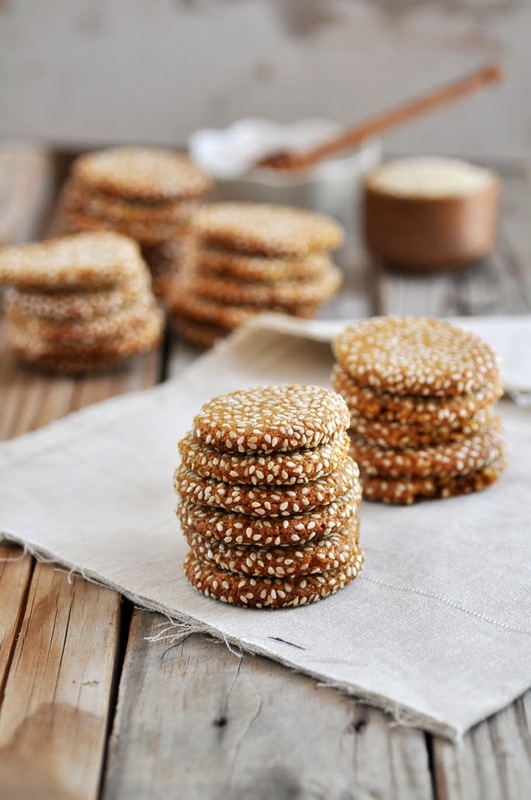 These cookies are the perfect for the low carb/healthy fat section: made of ground almonds and ground sesame seeds and sweetened with honey. A great snack that is not too sweet. I hope you enjoy. Add the almond meal mixture to the honey tahini mixture and stir until well incorporated. The dough should be solid enough to form balls. If it's too wet, add some more almond meal.